You have read several of my design group’s conclusions about the place of icons and text in game components through this series. Last column examined color, art, and keywords. Today we look at two other methods and get at several concrete examples of published games. We generally learn more from our mistakes than from our successes. What can we learn from the games on our shelves? 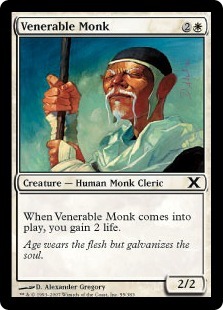 Standard cards have no text. They have numbers. They have letters. They have colors. They have suits. These are the icons of the standard deck. 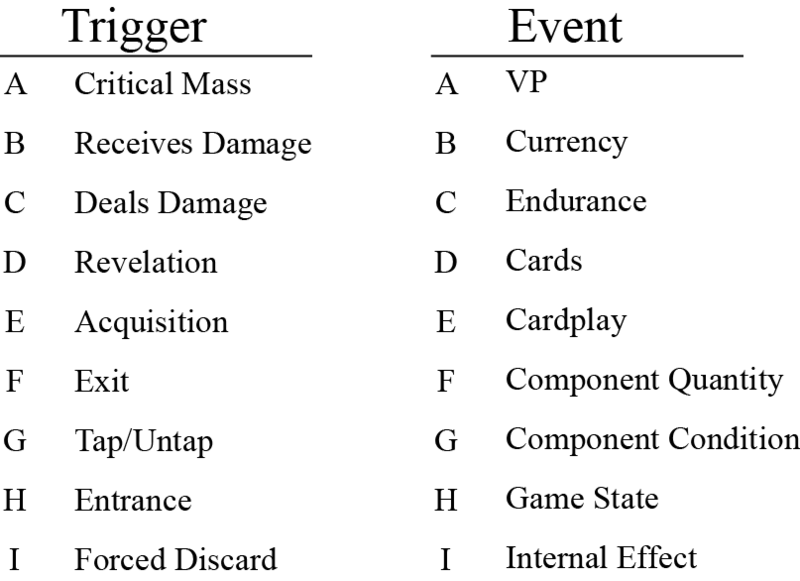 Each game which uses them defines those cards to its purpose. X-Wing uses both text and icons. 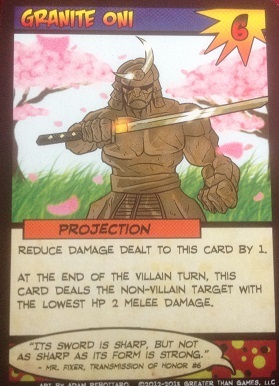 Pilot cards give all stats, actions and special abilities. Stats are designated with an icon and a color, actions are designated with an icon in black, special abilities are detailed with text. Each ship in play has a tile on its base which specifies its stats and pilot’s name. The pilot’s name functions as a keyword if you have learned that pilot. Otherwise, you can look it up on the pilot’s card. Each ship is itself an icon. Every ship of the same type shares the same set of stats. Thus, if my opponent places a Y-Wing on the board, I know immediately that it rolls two attack dice, rolls one defense die, has 5 hull and 3 shields, can focus and can target lock. I will still need to read its pilot name on the base to know if it also has any special abilities but I know quite a bit simply by looking at the mini. 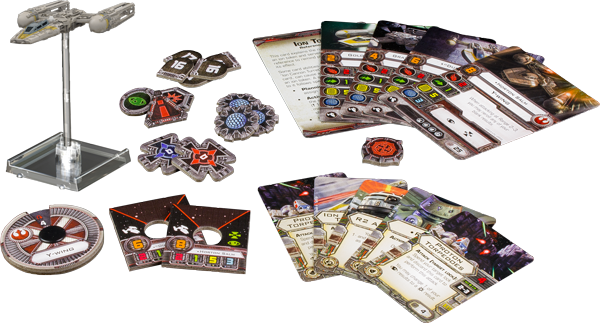 The X-Wing Miniatures Game did make one major graphic design error–the dice. Fantasy Flight elected to have red attack dice and green defense dice. Red/green colorblindness is the most common form. This has not been a major issue in my plays with a colorblind player–he simply asks me for the appropriate dice–but the fact remains that FFG would have been wiser to use white and black dice. Color is used throughout Donald X. Vacarino’s Dominion to indicate card type–gold for treasure, green for victory, white for actions, blue for reactions, orange for duration, red for shelters, brown for ruins. Consistent application of these colors is a handy reference for most of us. 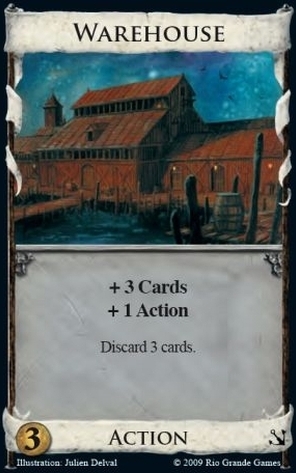 Because each card also has its type printed at the bottom of the card, component color is not mandatory and Dominion remains perfectly playable by the color blind. 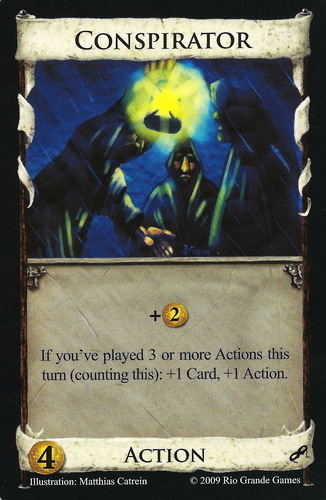 Like its booster pack-based forebears, Dominion also uses text to describe most game effects and card art may be seen as an icon for each card. Reiner Knizia’s Gem Dealer From Eagle/Gryphon games is an excellent example of failing to consider the implications of using color to indicate category. 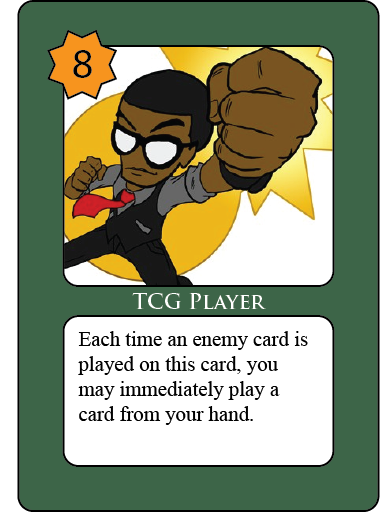 Nate Walker did the side-by-side comparison shown below and kindly posted it to BoardGameGeek. Under anything but strong lighting, these colors are completely indistinguishable no matter how good the player’s vision may be. If each gem also had a different shape, no issue would exist. Color can be an asset to identifying components. It is not good enough to be the only means of identifying them. AoE III perfectly missed the opportunity to use art as an icon. To the right, we see the set of Era II building tiles. Notice that Fortress and Military Academy have exactly the same effect–+1 soldier per turn but different art while Privateers and Taxation have completely different effects but the same art. How easy would it have been to use the same building art for Fortress and Military Academy, then use the musket-bearing figure to represent our Privateers. 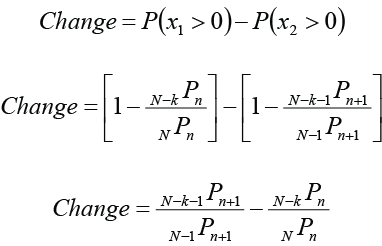 Rather than clarifying, the art here obfuscates the purpose of these components. John Eyster and I were discussing this blog series a few nights ago. He pointed out that AoE III also has a mass-o-plastic issue. The generic workers and the specialists tend to blend together on the game board. He’s not wrong. This is particularly troublesome since relative quantities need to be assessed and reassessed throughout the game. To be frank, I’d forgotten this issue since I replaced all the basic units with wooden cubes in player colors ages ago. These issues are particularly unfortunate in the case of AoE III. It’s a solid game. 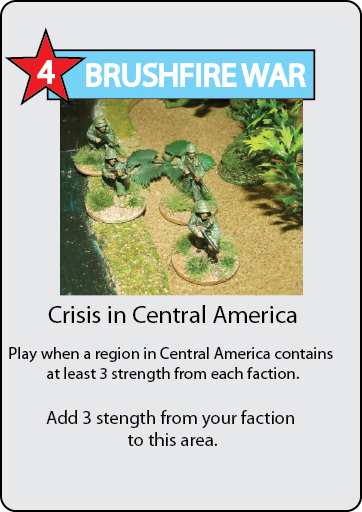 My first plays were of a preproduction copy at Origins Game Fair. That version still used cubes as workers (which was the source of my inspiration to do the same) and was so enjoyable that I made an effort to get in a second play before the end of the convention. There are many games at Origins begging for your attention so finding one you want to play repeatedly is quite unusual. AoE III was rereleased as Glenn Drover’s Empires: the Age of Discovery. I haven’t had the opportunity to try it out but hope that these design issues have been resolved. It’s quite a good game and deserves to have equally good art. What do these successes and failures teach us? They show that any method can be used well and it can be used poorly. So what should you do? I believe the correct answer lies in redundancy. Use multiple methods to reach your players. Include icons and make them match the card effect. Make keywords and include brief reminder text. Give your cards/tiles art and make that art evocative of the item’s meaning in the game. Use distinct minis or meeples that stand out from their neighbors. Rather than giving each player five different meeples, give each of your five players meeples which have unique shape as well as color. You will have a much greater chance of being clear when you employ more than one method to convey information. Nich Vitek did a phenomenal job of employing redundant information while developing the graphic design of 1955: The War of Espionage. 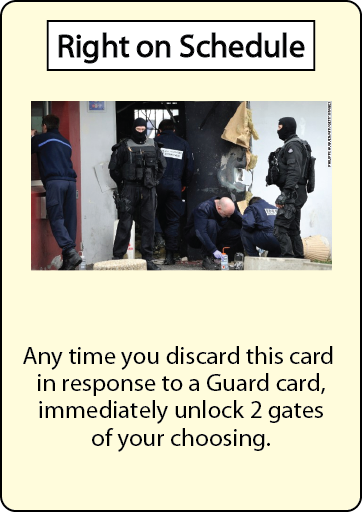 Each card conveys information in several ways. 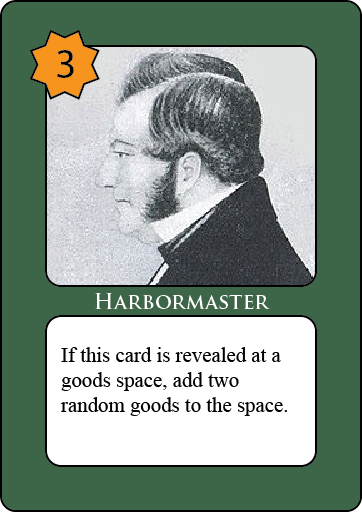 Consider this Military Transport card. We see by its flag that it is allied with France. We see by the number in the upper corner that it has strength 2. This information is repeated in the lower-left edge by its two blue stars. 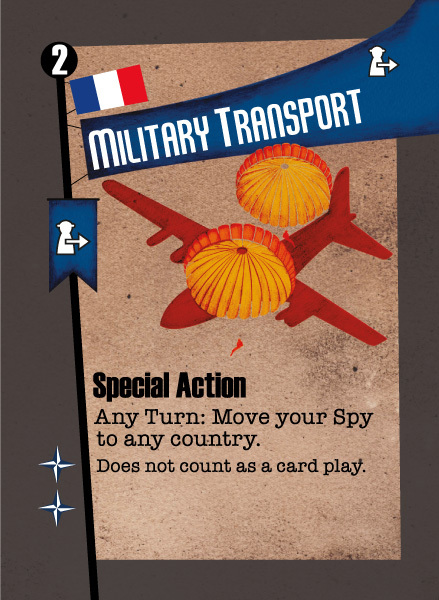 The image of troopers dropping from a transport plane implies the card’s special ability, which is also spelled out in the card text. 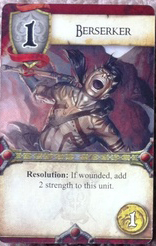 An icon appears in the left banner and at the top right of the card, both as a reminder of the card’s effect. How about you? What game do you think used text, component art, or icons most clearly? Which one did it worst? Share with your fellow readers in the comments below. And if you’re enjoying what you’re reading, create an account with WordPress and follow this blog. If you keep reading, I’ll keep writing. Next time we get together, my second book report! Have a great weekend and I’ll see you Tuesday!